The Tandy 1000 computers, more specifically the early Tandy 1000s, had many good features, graphics, sound, expansion, performance, integrated peripherals. To save development costs, Tandy imported some of its designs from prior, non-IBM PC compatible computers. The Tandy 1000 card edge printer port can be traced back to the TRS-80. The Tandy 1000 joystick ports came straight from the Tandy Color Computer. And finally, the Tandy 1000 keyboard is the same keyboard used in Tandy's MS-DOS (but not IBM PC) compatible Tandy 2000. The 90-key Tandy 1000 keyboard is not exactly a pleasure to use. Its layout is cramped and awkward, its keys are mushy and there is no tactile feedback. Compared to the IBM PC or IBM PC AT keyboard, it feels cheap. Typing mistakes are frequent with this keyboard. It has some odd key omissions. There is no Scroll Lock, and while there is a separate Home key, there is no separate End, Page Up, Page Down, +, -, or * keys. The shift keys are too small. While it does have F11 and F12, software made during the Tandy 1000 (except by Tandy) lifespan rarely used these keys. Finally, the Tandy 1000 has the dreaded Hold and Print keys. Both keys are next to important keys like Enter, Alt and Num Lock, The Hold key acts like a true Pause key, everything is frozen until you hit the Hold key again. People who do not know or forget how the Hold key works may think their computer has crashed. However, the really evil key is the Print key. Press this key twice and, unless you have a printer attached to your computer, your computer will freeze as it vainly tries to print what you are typing on the screen. Your computer will appear to freeze. IBM avoided this issue by assigning the function to Ctrl+Print Screen. Until now, any kind of accurate Nintendo NES or Famicom console had to use Nintendo's CPU and/or PPU chips, whether that console was manufactured by Nintendo, Sharp or anyone else. While the idea of implementing a NES on an FPGA was an idea with a long history, only this year are products finally making it to market. Here I am going to compare the features of the two announced FPGA NES implementations, the RetroUSB AVS and the Analogue Interactive Nt mini. Boulder Dash was originally released for the IBM PC and PCjr. in 1984 by First Star Software. The disk included two separate executables, one for the IBM PC and one for the IBM PCjr. The disk was a PC booter. The IBM PC executable is serviceable but not particularly impressive. There is a distinct lack of animation on the title screen and for the amoeba tiles. There is also no color-cycling effect for the diamonds. It is debatable whether the game really uses composite color graphics. Sound effects are weak even by PC speaker standards. In late 2011, a new homebrew cartridge was announced for the Atari 2600. 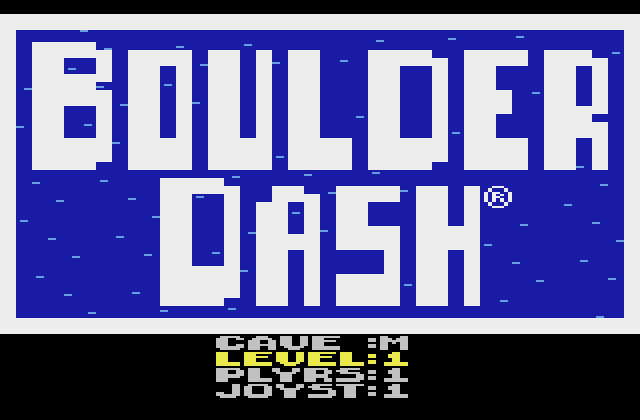 This would be a port of Boulder Dash, the classic computer game originally developed on the Atari 800 home computer by Pieter Liepa and Chris Gray. Their game was bought by First Star Software, which published it for the Atari 8-bit, Commodore 64, Apple II and IBM PC & PCjr. computers in 1984 as well as for the Colecovision. FSS also published the sequel, Boulder Dash II : Rockford's Revenge and Boulder Dash Construction Kit. FSS's other well-known game series is the Spy vs. Spy games. Boulder Dash was very popular, with the game being ported officially or unofficially to many different platforms. The Amstrad CPC, BBC Micro, Epoch Super Cassette Vision, Game Boy, MSX, NES, PC-8801 and ZX Spectrum all received officially licensed ports. Except for a period from around 1991 to 2001, there has rarely been a year gone by without a release or re-release of Boulder Dash in some officially licensed form. Today it can be purchased on mobile platforms. If you wanted to build a DOS PC, what would you build? The answer depends in no small part on what you expect it to run. Do you want a system that can run the oldest games? In that case you will probably want an IBM PC, XT or one of the earlier Tandy 1000 series systems. Perhaps even a PCjr. or a Compaq Portable? But those systems are often running PC Booters as much as they are running true DOS games. Fast forward a couple of years and you get into EGA and VGA systems. Now you are dealing with higher speed 286s, 386s and 486s. Even though many of the more speed sensitive games will fail to run on these systems, the classic DOS era is at hand. But suppose you want something with 3-D acceleration and high resolution color in mind. Then you are looking at Pentium systems and sharing drive space with Windows 95 games. Duke Nukem 3D, Fallout, Magic Carpet 2 require more than what most 486s will give. I would suggest that most people probably received their first introduction to IBM compatible PCs and DOS in the early 1990s, "When VGA Was King." In those days, then-young adults like myself were in awe at the beautiful graphics of the King's Quest games, addicting world-building simulations like Civilization and complex role-playing of the Ultimas. We saved our allowances to buy a Sound Blaster card because systems did not come with sound cards as a standard feature until well into the mid-90s. We looked eagerly at the new CD-ROM technology, waiting for it to drop in price and salivated at The 7th Guest and Myst (and found out that cutting edge technology seldom lives up to the hype). PCs had something to offer that our NES, SNES and Genesis consoles could not. Building a DOS system often addresses that era of early 90s gaming with the ability to reach somewhat back to the late 80s and forward into the mid 90s. Building vintage computer systems has become something of a niche hobby, but now one with very dedicated members. My own humble writings here and elsewhere may have made some small contribution to this phenomenon. But when someone like Lazy Game Reviews decides to post a system build video, it will get a great deal of attention. With almost 400K Youtube subscribers and videos easily ratcheting 100K views within a short period of time, he is sufficiently successful on that he does not need a day job. Although far many more people watch his Sims videos than his retro-computing videos, there is enough overlap that his message reaches many more people than anyone else I know of who regularly covers retro-PC topics. IBM PCs and compatibles had an analog joystick interface. The Tandy Color Computer and clones like the Dragon 32/64 computers also had an analog joystick interface. Inside an PC or CoCo joystick were a pair of potentiometers. The chief difference between the two interfaces is how the potentiometers were connected. PC sticks used the potentiometers as variable resistors, wiring two of the three terminals, one of which to +5v and the middle would be connected to the interface's input. CoCo sticks used the potentiometers as voltage dividers, where all three terminals would be connected, one outer terminal to +5v, one outer terminal to ground and the middle terminal would be connected to the interface's input. In the early days of home computers, a joystick could be used for more than just playing games. It could function as a cursor controller like a mouse, which was useful for drawing programs. It could also be used for flight simulators, where the analog control could be appreciated. Most home computer games from the 1980s that support a joystick were ported or derived or inspired by the popular home console and arcade games of the time. Games like Pac-Man, Pitfall and Space Invaders did not really need an analog stick, they usually used digital joysticks. When platforming games like Super Mario Bros and Prince of Persia became popular, they often or exclusively used digital gamepads.